The year after we walked the Camino de Santiago, we journeyed to our former home, Scotland, to walk the West Highland Way. It was magnificent! Sue has a slide show for you. After sleeping in 23 beds in 35 days, we are ready to go home. There is just one problem: We sold our home and the bed with it. We will have to make do, for now, with a rented condo in Ashland, Oregon. It will be home for the next three months and we are looking forward to staying in one place for awhile. The trekking part of the journey took us to magical lands in the Highlands of Scotland. 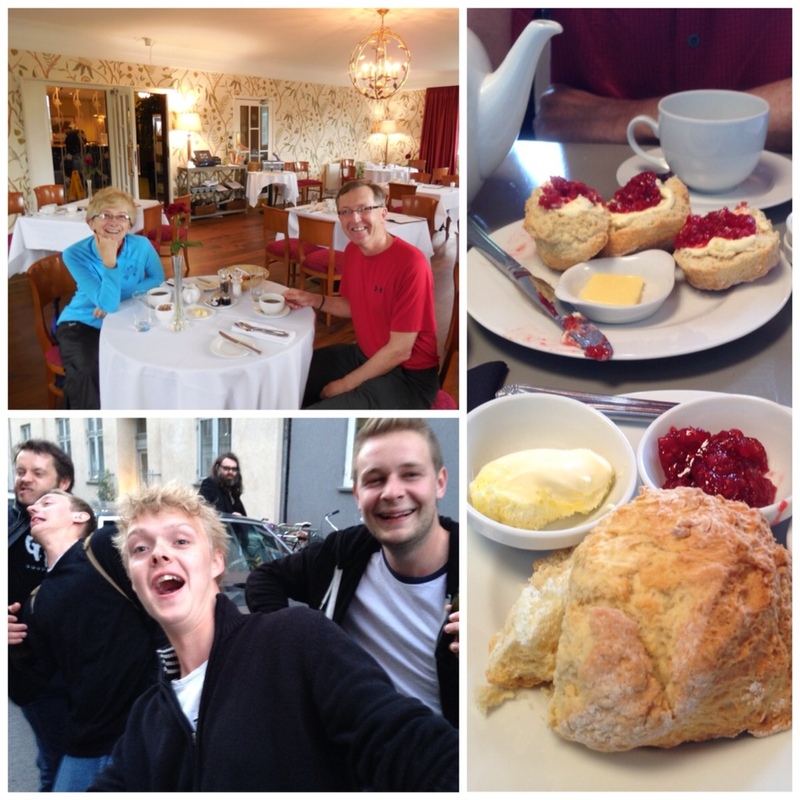 By car, we visited great friends in Scotland and England. By plane, we dropped in on our Camino buddies who showed us Denmark from the city to the country to the beachside resort. We hope we get a chance to return our friends’ hospitality. For now, we fly “home” with treasured memories. We enjoyed a great breakfast at the Bridge of Orchy Hotel and cream tea (note the glob of clotted cream) at Glamis Castle in Scotland. The locals were welcoming and some, like these Danish guys, wanted a spot in the photo album. Sometimes the trail led to seemingly endless Scottish wilderness. We traveled 1,400 miles in our Vauxhall rental, a GM car. The sign on the trail firmly ordered us to stop. It seemed that the Forestry Commission was logging along the section of trail in front of us. We looked to our right where another sign politely insisted we take an alternate route; a diversion. With apologies for the inconvenience and a promise that the new route would “be just a slight bit longer,” it also warned of being “rather steep, slippery and uneven, so do be careful.” An orange arrow pointed us downhill. It was suggested that bicycle riders dismount. We looked at each other, rolled our eyes and began the descent. The good news was that our diversion provided us with a great view of Loch Ness. Steep? Yes it was. We dropped all the way down to the road, traveling parallel with the traffic before starting the climb back up from where we came. As you can see in the bottom left photo, Reg is just a blue speck as he makes his way back up to the trees that border The Great Glen Way. So, one never knows where the road ahead will lead and diversions are inevitable. While we've decided to end our walking two days early and head for Inverness, we look forward to new adventures…on our diverted path. Ah, what a journey is the West Highland Way! Scotland, 2014: Thirteen days afoot, more than 150 miles. It is time to write the journalist's “30” on this journey. We are jumping on a bus tomorrow and heading to Inverness for a couple days before driving to Fife to see our dear friends there. A week in a Crail seaside cottage sounds amazing just now. 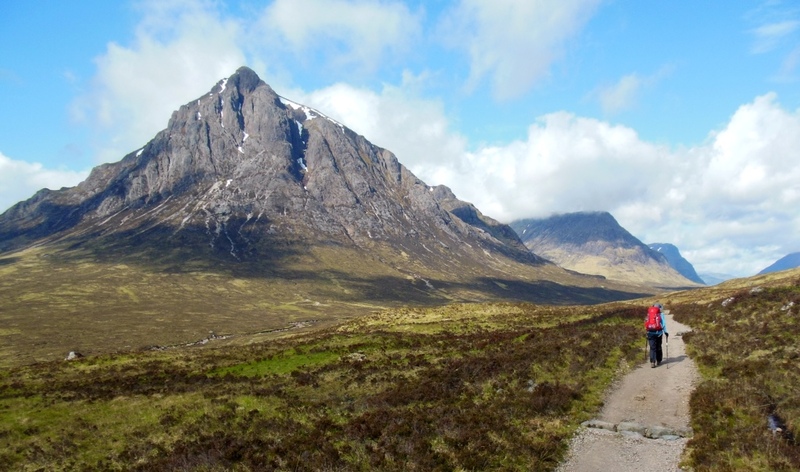 The West Highland Way lives beyond expectations, both in beauty and degree of difficulty. What a trek, indeed! Day 1: Glasgow to Milngavie. 11 miles. This is not part of the official trail, but it is a beautiful, flat walk along the River Kelvin. A good warmup. An old man at an even older pub, the Clachan Inn. Day 2: Milngavie to Drymen, 12 miles. The official start of the walk and an easy trek. The Landers Bed and Breakfast in Drymen was a good choice; the hosts were so welcoming. 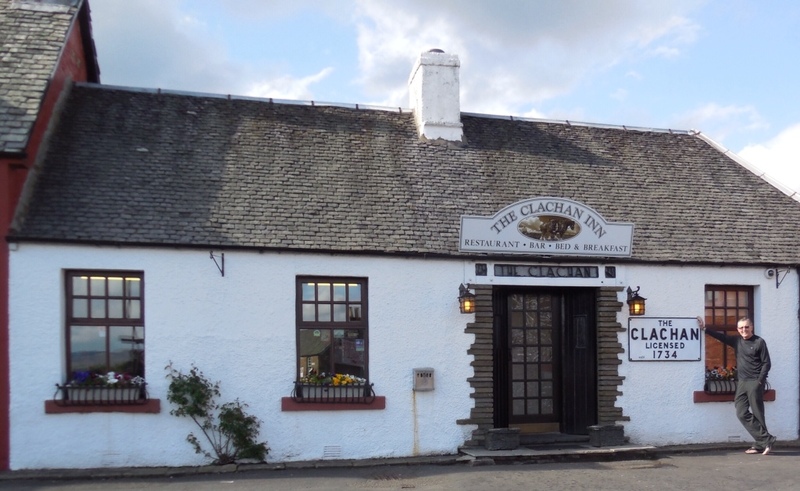 Drymen's Clachan Inn is supposedly Scotland's oldest bar. We had drinks in the tiny, charming pub and dinner next door in the restaurant. A rock was a perfect picnic spot on Conic Hill. 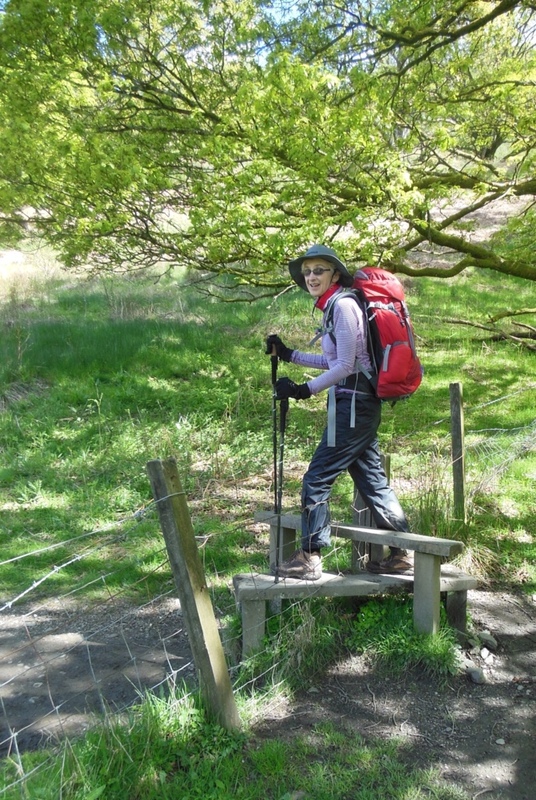 Day 3: Drymen to Balmaha, 8 miles. The climb up and down Conic Hill was a highlight. Fabulous views of Loch Lomond and our first glimpse of the Highlands. The Balmaha House bunkhouse worked out well. 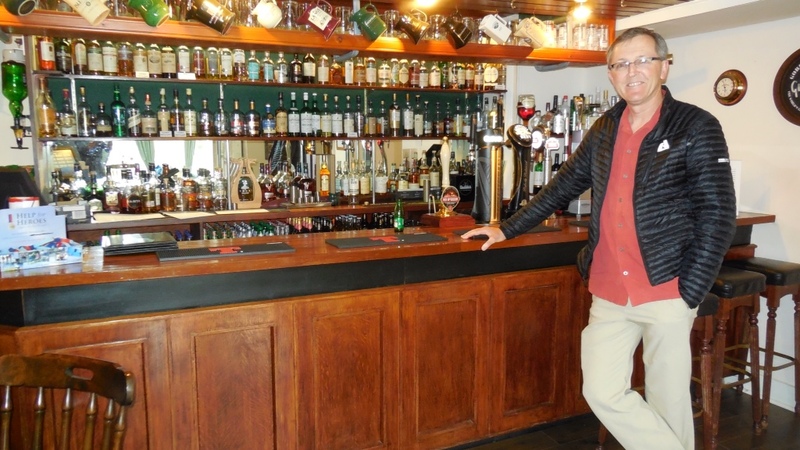 We had drinks and dinner in the pub at Balmaha's Oak Tree Inn, a place filled with character and Scottish charm. We had a wet picnic on Loch Lomond on Day 4. Day 4: Balmaha to Inversnaid, 14 miles. A walk along Loch Lomond with views of Ben Lomond. We stayed at the bunkhouse up the hill from Inversnaid (they picked us up and returned us to town the next morning). Tiny bunkrooms, but a bar/restaurant in the old church is filled with personality, good fun, and superb food. This place was a highlight of the trip for us! A stile was one of many ways to get over a rancher's fence. 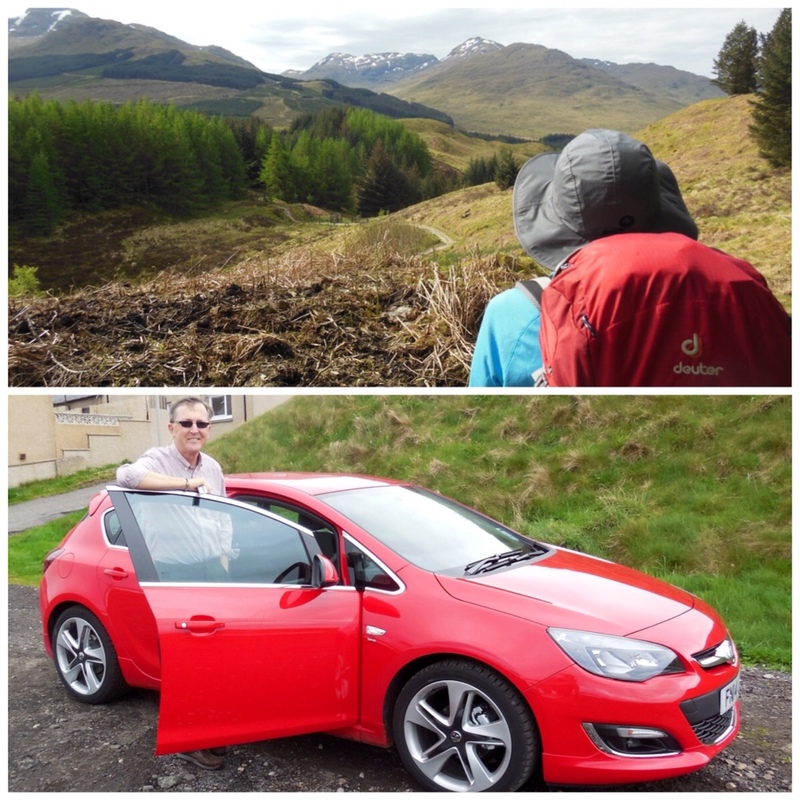 Day 5: Inversnaid to Crianlarich, 13 miles. The five miles out of Inversnaid was quite difficult, taking us along the banks of Loch Lomond over large rocks, massive tree roots and mud. One minute, up the hill, next minute, down. This was by far the hardest day of the entire trek. 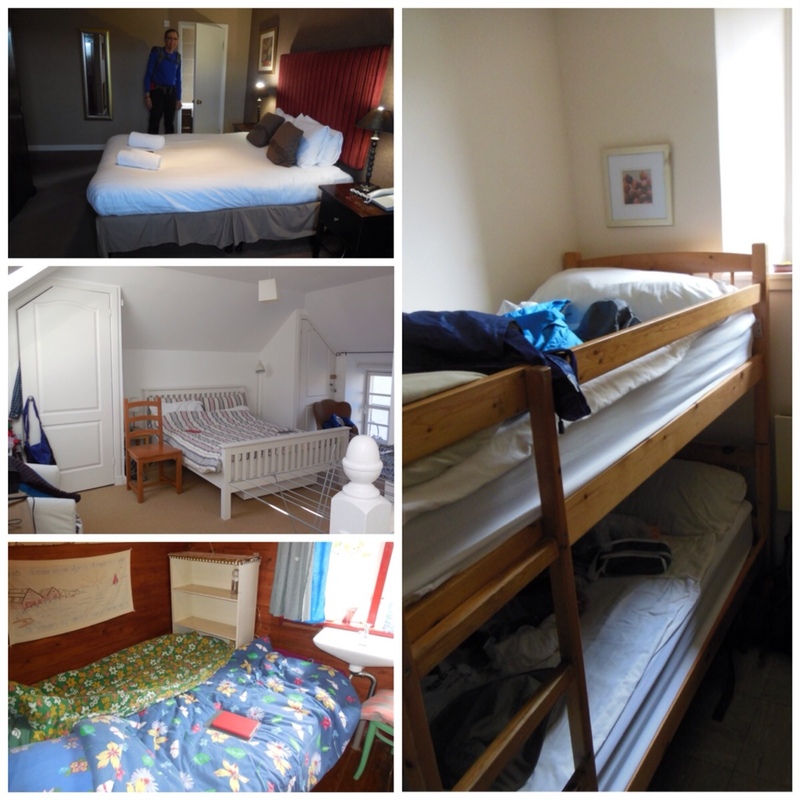 We stayed at the Youth Hostel in Crianlarich, a nice facility. Remote, but refined, the Bridge of Orchy Hotel. Day 6: Crianlarich to Bridge of Orchy, 13 miles. You are in the Highlands now and the scenery gets better with each step. For the rest of the West Highland Way, you are mostly traveling where cars can't go. There are so many times we stopped in awe of the landscape. 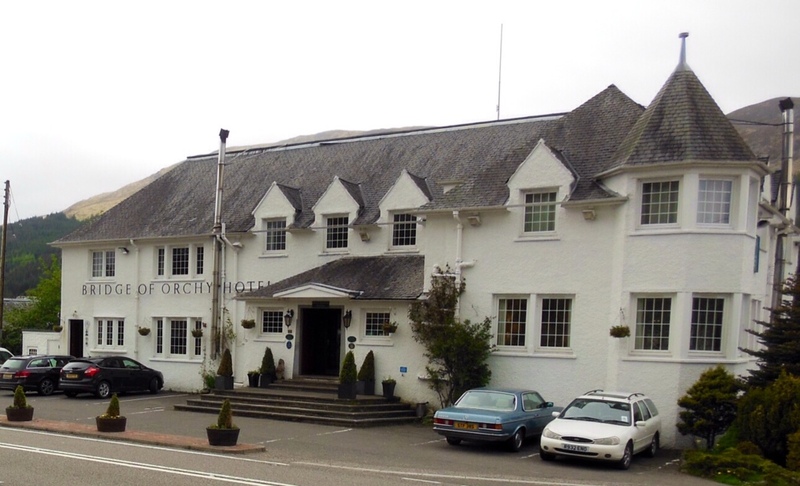 The Bridge of Orchy Hotel is in a remote area and is pricey, but wonderful. The King's House Hotel was our favorite spot on the way. Day 7: Bridge of Orchy to King's House, 13 miles. Just when you think the scenery can't get more stunning, it does, and in a big way. The approach to Glen Coe at the end of the day redefines magical. 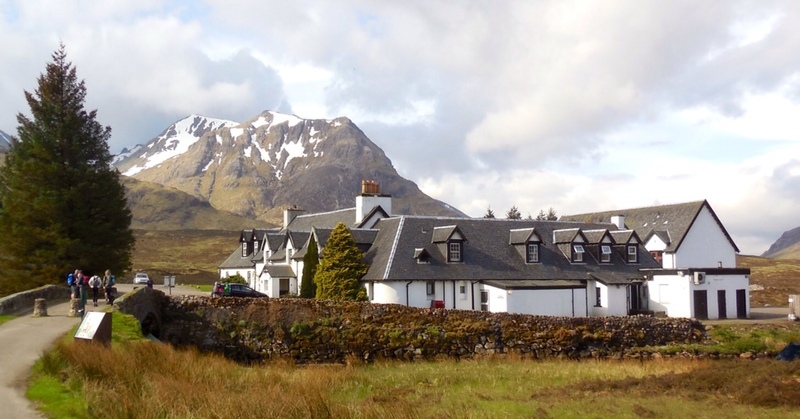 The King's House Hotel, like the Bridge of Orchy Hotel, is about 300 years old, expensive, but worth it, considering the location. So many pubs, so many beers, and some whiskey. Day 8: King's House to Kinlochleven, 9 miles. You walk up a place called Devil's Staircase, but the scenery is heavenly. The ascent is not as difficult as the name implies, but the descent into Kinlochleven is quite a test for the knees. Lunch was usually a picnic along the trail. Day 9: Kinlochleven to Fort William, 16 miles. A steep climb out of town into more incredible Highlands views toward Ben Nevis, Britain's highest peak. Unfortunately, we finally got a day of real Scottish weather, which hid the mountaintops. We stayed at the Bank Street Lodge, a Fort Williams hostel with lots of private, en suite rooms. Nice place, very friendly. 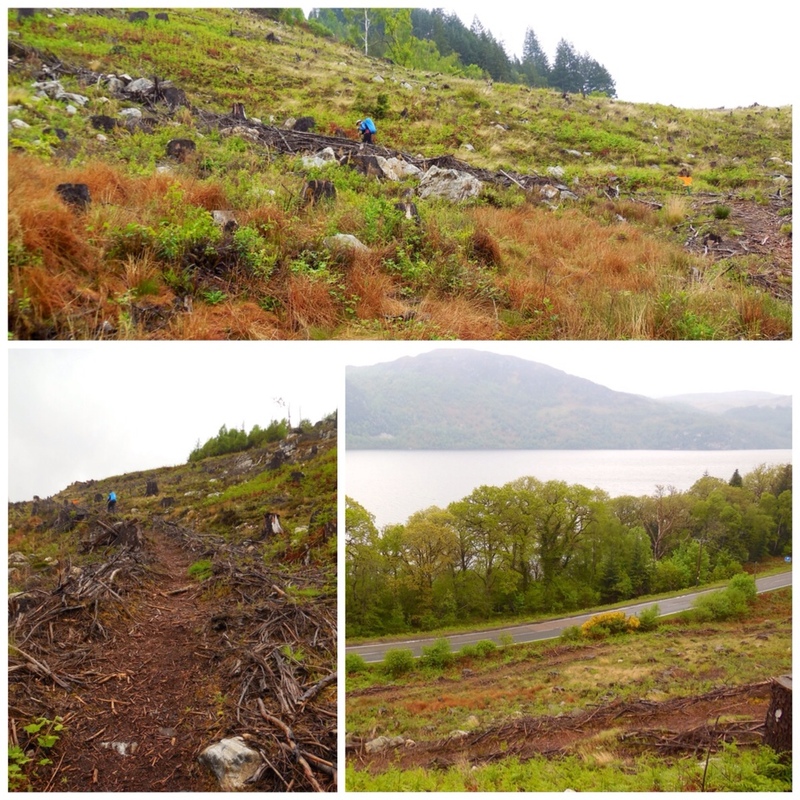 Day 10: Fort William to Gairlochy, 11 miles. 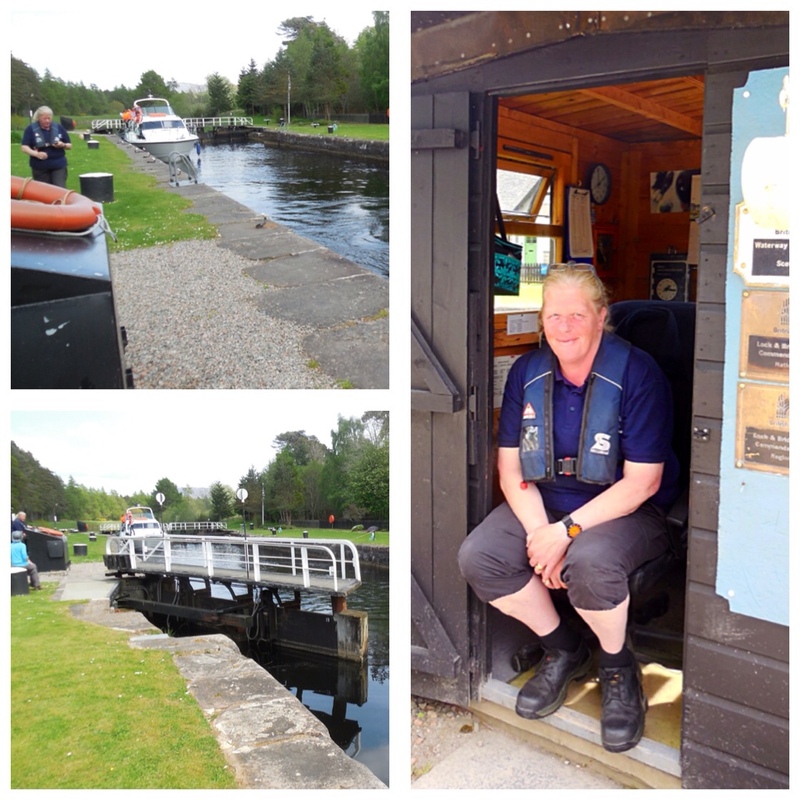 A flat walk, with a look at some locks on the Caledonian Canal. A second day of rain. 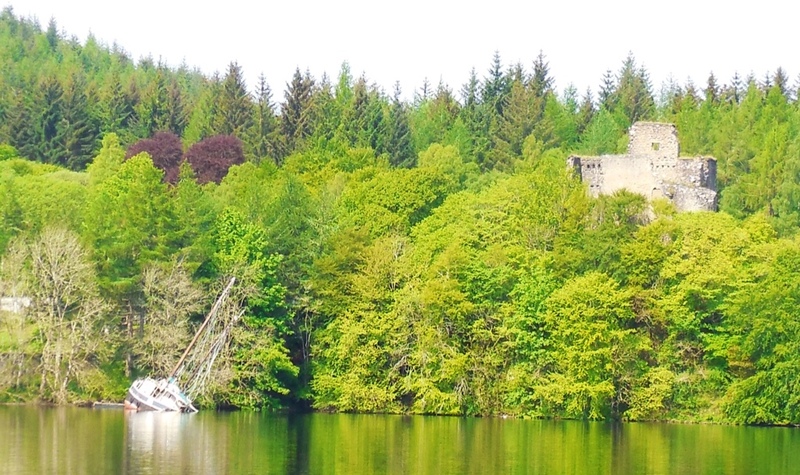 A ruined castle and boat marked the Great Glen Way. Day 11: Gairlochy to South Laggan, 13.5 miles. Another mostly flat trek, with spectacular views back toward Ben Nevis. 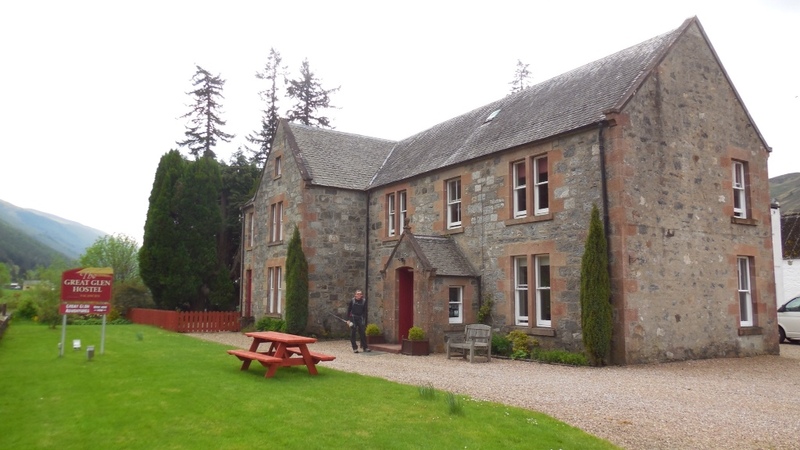 We stayed at the very nice Great Glen Hostel. No restaurants there, but the hostel has a small store and a great kitchen. 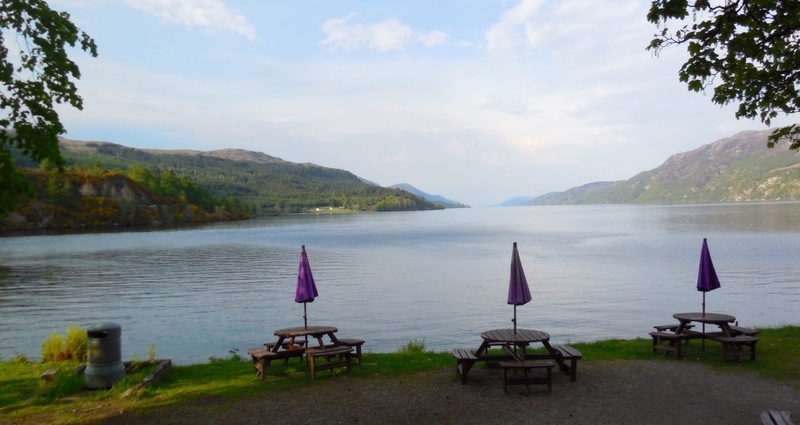 Our Loch Ness view at dinner In Fort Augustus. Day 12: South Laggan to Fort Augustus, 9 miles. This was the best day of four we walked on the Great Glen Way. Warm, sunny day, with nice views of Loch Oich, the mountains, and the Caledonian Canal. Had a very good dinner at the Boathouse, next to the shores of Loch Ness. Our outstanding B&B in Invermoriston. Day 13: Fort Augustus to Invermoriston, 8 miles. 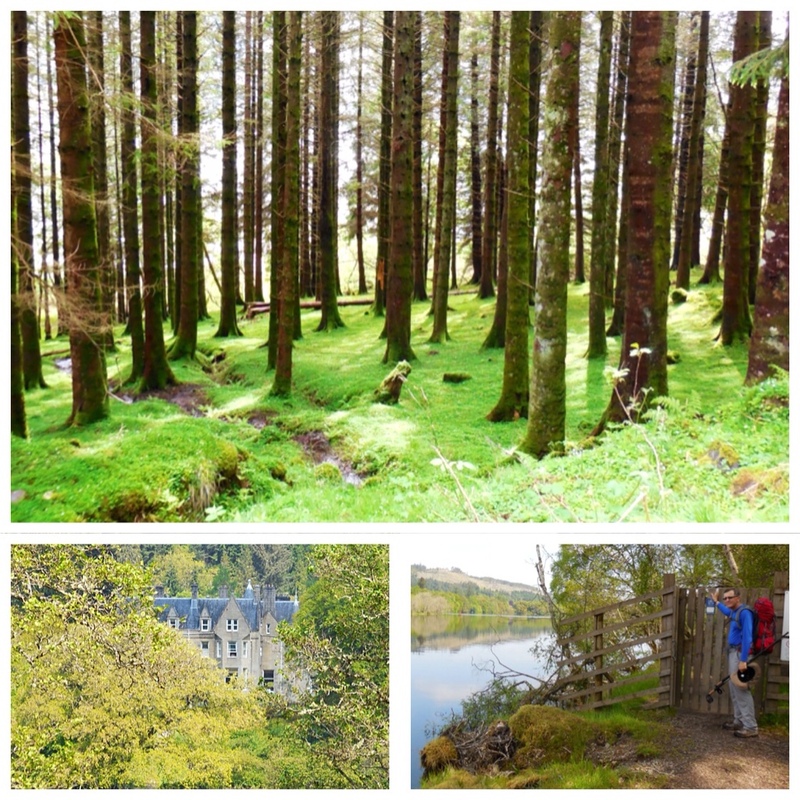 A few views of Loch Ness, mostly a forest walk. 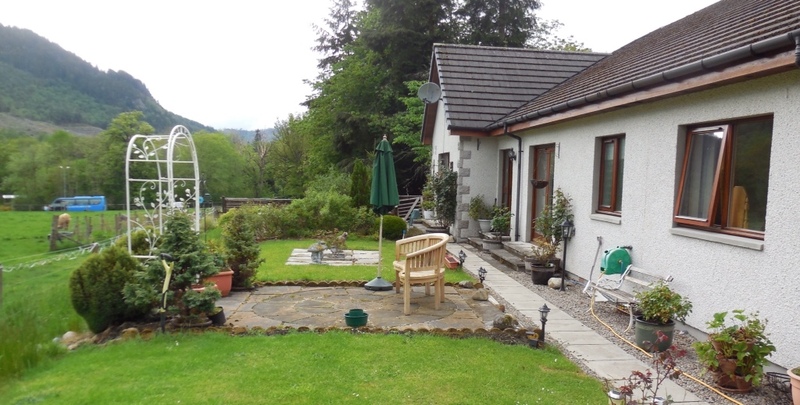 Kirkfield B&B in Invermoriston is a superb choice. If you watch Mad Men, the proprietor here is Betty Draper. Sue sets out from King's House at Glen Coe. This is Scotland! Tulips signal spring has arrived; Scottish pride on the flag pole and in a bottle; sheep are everywhere; a wet and slippery tunnel under the railroad. An old cemetery on a family sheep farm; the clouds above are as beautiful as the landscape below; this cottage is dwarfed by the Munro behind; a simple Scottish breakfast; A piper greets us at Fort Augustus. 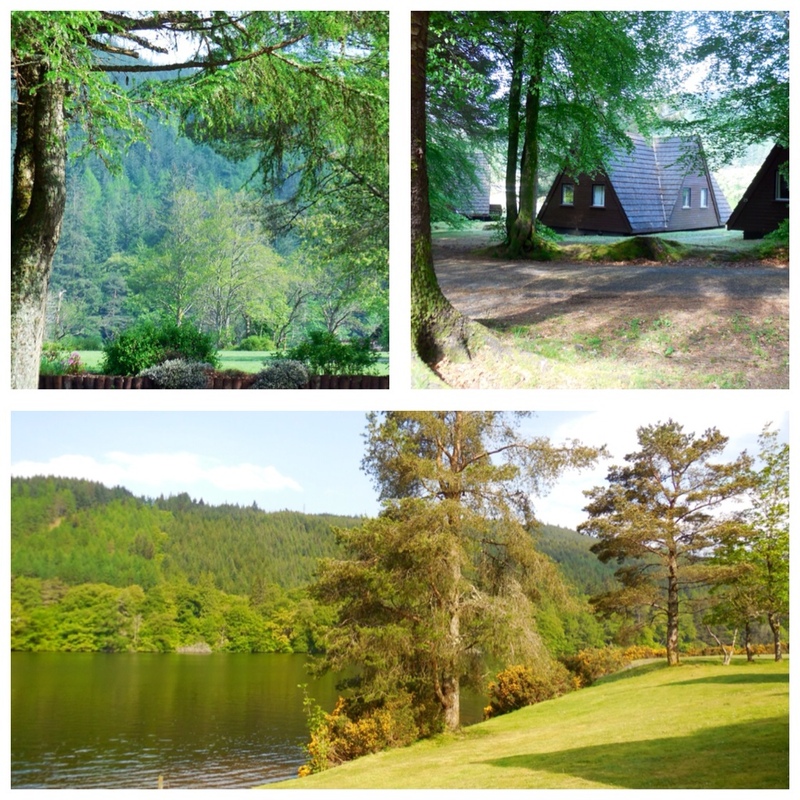 The Great Glen Water Park is a beautiful spot for a self-catering holiday. 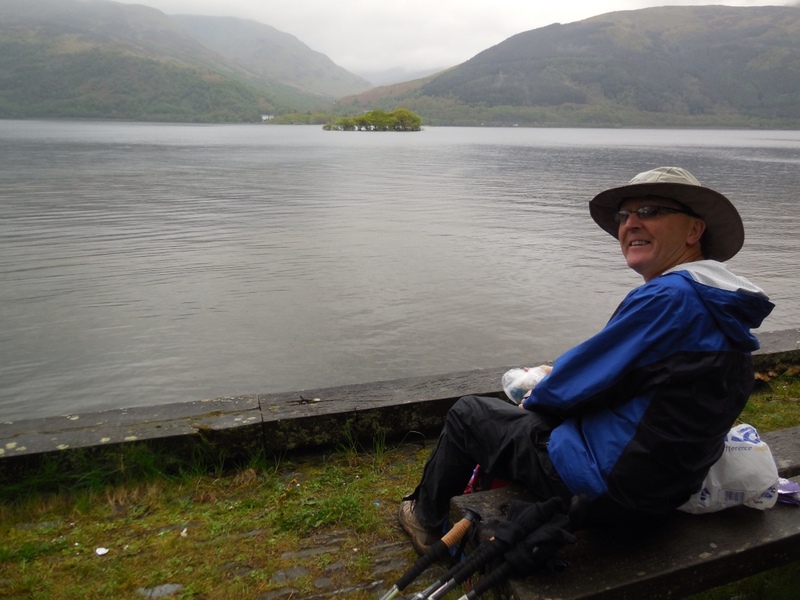 While Reg “went the extra mile” for us today, in search of lunch, I relaxed and admired the view from the restaurant patio of The Great Glen Water Park. I was promised a short day; just nine miles. No backtracking for me…my feet were not going to walk any more than that! Today was a beautiful warm day with barely a cloud in the sky and I had a pleasant spot to relax. We didn't get the early start we had hoped for, but once we got going our day was beautiful. We've seen some beautiful scenery since we set out from Fort William. Today's walk was a pleasant, flat path along the old railroad tracks. It took us through woods, alongside Loch Oich and into Fort Augustus for the night. We rested our feet and backs while watching this chatty Lock Master do her job. As we approached Kytra Lock, we had a front row seat where we saw just how the boats maneuver through the locks. Under the skilled hand of the Lock Master (this one was a woman) the water level rose and lifted the boat to the level of the canal. Once the water levels were even, the gates swung open and we all waved as the boat cruised through. Unfortunately this crew was headed in the opposite direction as us, so we were unable to hitch a ride! We are in South Laggan tonight (Monday). The Eagle Barge Inn, where we stopped for a drink this afternoon. The Great Glen Hostel, our home tonight. After our second day on the 73-mile Great Glen Way, we are staying in a great hostel in South Laggan. We scored a private en suite room. It helps to be one of the first to arrive! We have trekked about 130 miles from Glasgow and we are sore and tired. When we planned the trip in January, we did not know the West Highland Way would be as tough as it turned out to be. The middle day along Loch Lomond was quite a test. Last winter, we had debated a rest day in Fort William and decided we wouldn't need it. It turned out we would have welcomed it. Nonetheless, we loved the West Highland Way. We have never seen more stunning scenery. As we began the Great Glen Way, we thought about taking a bus out of Fort William when it was raining, but our pride won. (And we would have had to endure our friend Malcolm's ribbing!) Honestly, the busses weren't running because it was Sunday. 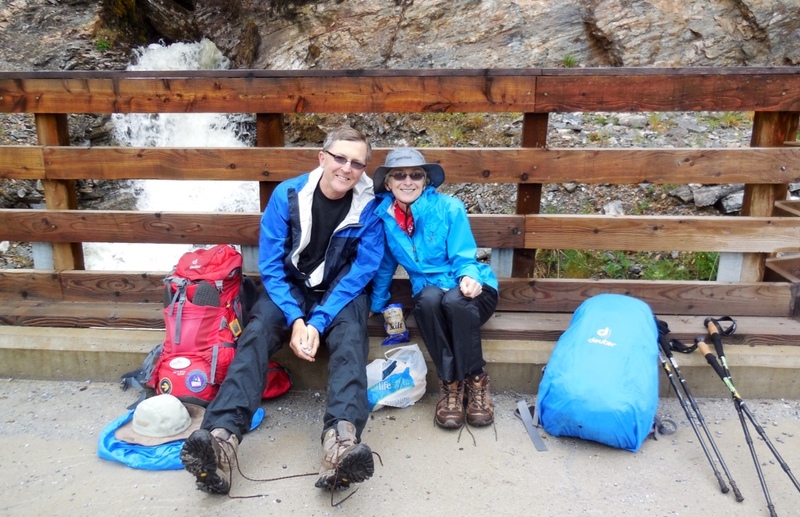 A highlight of these treks is the people we meet along the way. Two college guys from Niagara Falls are walking the Great Glen Way, then plan to stay at a monastery in Elgin, Scotland for four days. Why? To experience it, they told us. One said his dad had considered the priesthood and the other said his grandfather had done the same. They are probably glad neither followed through. 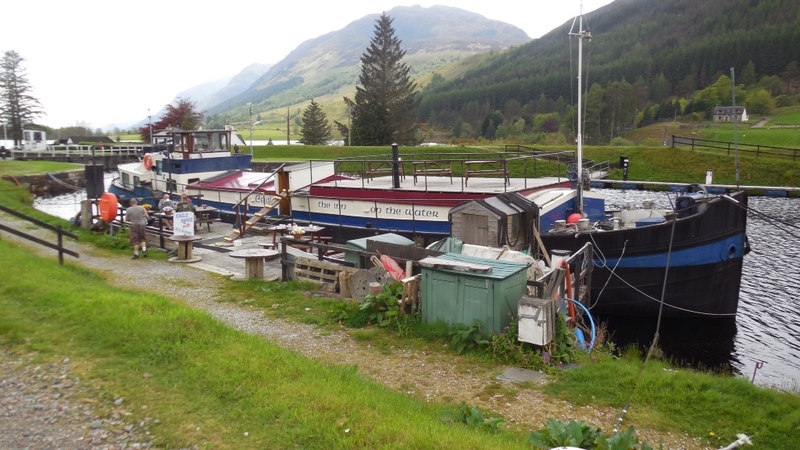 We stopped today to have drinks and scones on a barge that doubled as a pub on the Caledonian Canal. There, we chatted with a Swiss man who had walked the Camino de Santiago, but he started in Switzerland! About 1,200 miles. He has also walked from Switzerland to Rome. In the Highlands, we talked to a 30-something Englishman who was walking to the north coast of Scotland to work for the summer. Everything he owned was on his back. Another Englishman was walking from the southern tip of England to the northern tip of Scotland. Most walkers on the West Highland Way had their packs/luggage picked up and transported to their next accommodation each day. So far, it seems most on the Great Glen Way are carrying their belongings. 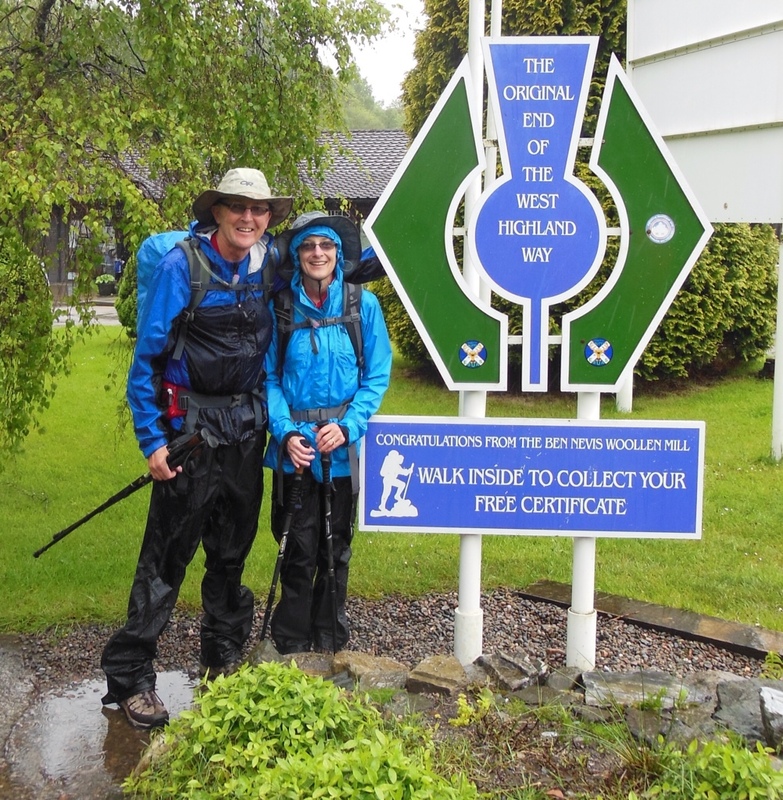 We faced another wet day as we started our week-long trek towards Inverness along the Great Glen Way. We said good-bye to Fort William Sunday morning as we continued on our trek through Scotland. We also said good-bye to some familiar faces. We've (proudly) been keeping pace with a group of college kids for the last few days. Sometimes passing them on the trail, but more often getting passed up by the foursome. Yesterday, they reached Fort William just before us and are now heading their separate ways. A chance meeting at breakfast Sunday reunited us with Heather, our roommate from several days ago. She also has ongoing European travel plans before heading back to school for a graduate degree. It's exciting to hear what these young people are doing…things that we never would have considered when in our twenties. All are really nice kids who didn't seem to mind talking with us old folks! 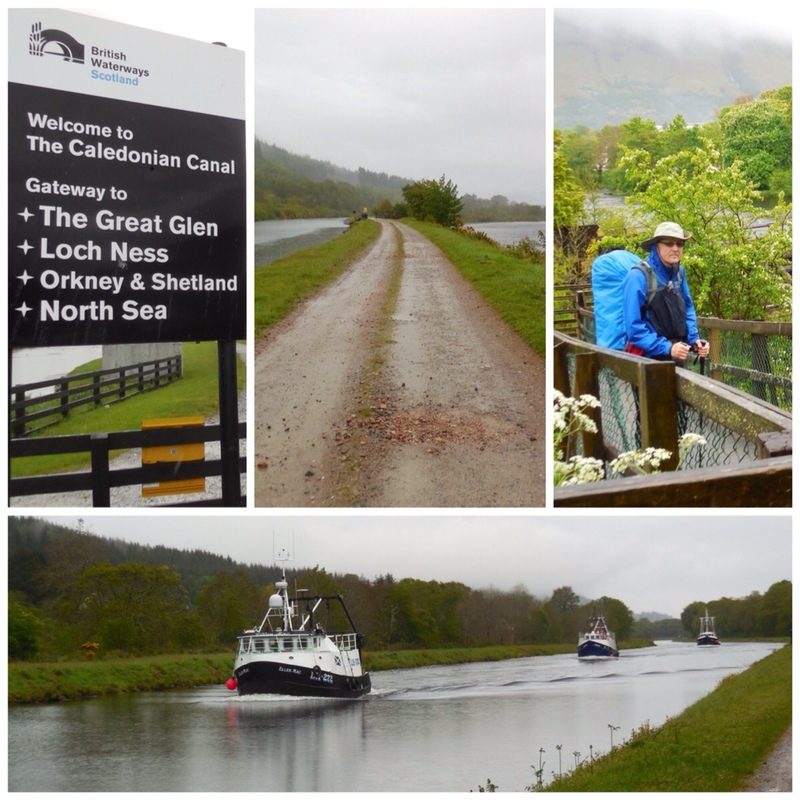 So we wished them all well and set off on the next leg of our adventure, The Great Glen Way, along the Caledonian Canal towards Inverness. 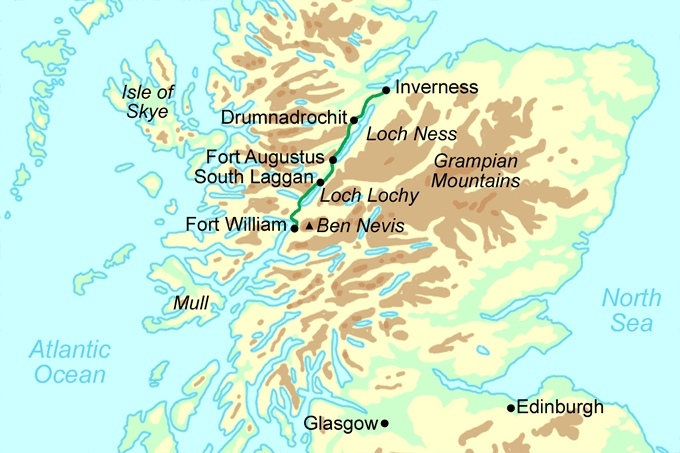 The waterway creates a shortcut for vessels, linking the east and west coasts of Scotland. Today we saw a parade of fishing vessels cruising through, as well as several pleasure boats. The rain eventually tapered off as we enjoyed a change of scenery and a very flat pathway. We exchanged greetings with several fellow trekkers at the finish. The skies over the Highlands opened for our ninth day of walking from Glasgow. The rain also kept crowds at home as we walked into the end of the West Highland Way in Fort William largely unnoticed. Days of rain: Just one! We are due to start the Great Glen Way to Inverness Sunday, but if it is still raining, we may opt for a bus to our first bed and breakfast. For now, it is time to find a pub to celebrate! Buachaille Etive Mor loomed outside our Kingshouse Hotel window this morning and later when we set out on our way to Kinlochleven. 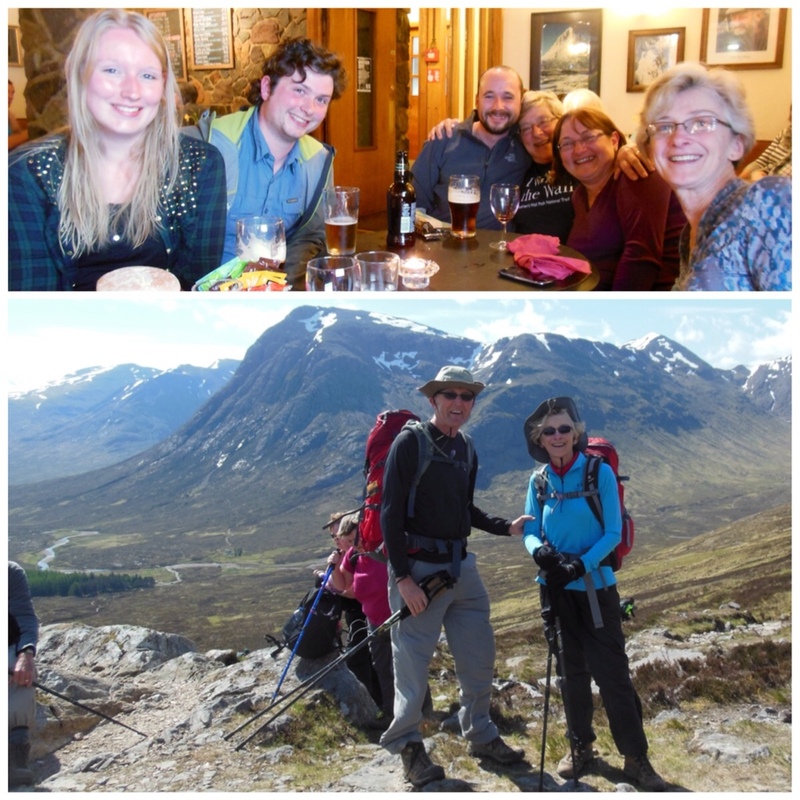 Fellow diners at the Kingshouse pub included trekkers from The Netherlands, Germany, Scotland and England. We took a photo break after climbing the Devil's Staircase. Camaraderie has progressed as we get deeper into the Highlands on the West Highland Way. There is a sense of impending accomplishment as those of us in Kinlochleven tonight anticipate our 16-mile walk to Fort William and the end of the trail. We are bunking in a hostel tonight after staying in extraordinary 300-year-old hotels the past two nights. We had beautiful weather today, but rain is expected tomorrow.